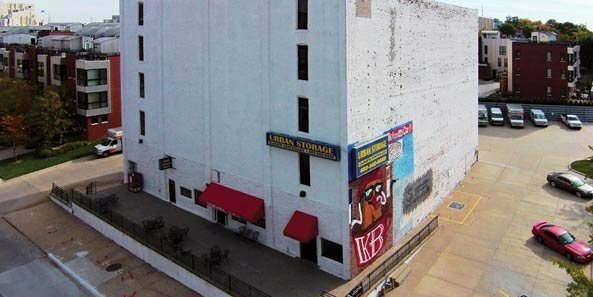 In August 2014, Natural Ventures purchased Urban Storage, a climate-controlled self storage company, and the building it occupied at 1215 Leavenworth Street in Omaha. The property contains a 36,000 square foot warehouse and 45 parking stalls. Built in 1886, the building has had a variety of uses over the years with beginnings as the Bain Wagon Building, home to a wagon assembly company. In more recent years, it has been used for cold storage, general warehousing, plumbing supply and moving storage. Since 2007, it has been occupied by Urban Storage and also contains retail space. Tony Regier, owner of Natural Ventures, said the company was inspired to purchase the building to implement a “modular business framework.” He said that decision was influenced by the location of the building, the available parking and the layout of the building. After the building was purchased, Regier and his team began massive renovations to restore the building’s exterior and interior, including restoring the original floor and interior brick walls. Three businesses will occupy the renovated space. Natural Ventures will continue to operate and grow the climate-controlled self storage business under a new name, The Storage Loft. The second business, Natural Therapy, will occupy 4,500 square feet of retail space on the first floor. Natural Therapy will provide acupuncture, herbology, nutrition, massage, yoga, occupational therapy, physical therapy and speech therapy services to clients. The third business, Natural Grounds, is an organic coffee, tea and herb storefront. The store will occupy approximately 800 square feet and will also be accessible from Natural Therapy.